Critics of the Federal Reserve are popping up everywhere. They say that the Federal Reserve is not paying attention to “what markets are telling” us about the economy. However, the stock market does not reflect the entire economy or currently provide an accurate picture of the health of the entire real economy. The small business sector represents the other half and it continues its two-year run of record high optimism levels, an important consideration for the Federal Reserve in formulating their policy decisions. In addition, critics have forgotten what impact zero interest rates have had and are still having on investment options including bonds and savings accounts. If investors can’t earn anything in bonds or savings accounts, they put their money into stocks and real estate, bidding up those prices. When interest rates start to normalize (i.e. raise), other investment options become more attractive. The price of shares of stock in a company reflect the earnings the company makes and is expected to make. The price of the share multiplied by the number of shares outstanding is the value of the company. Similarly, the value of our stock markets must collectively reflect the value of the production of all of our publicly-traded companies taken together. But again, that is not the full picture. Small businesses are not represented in the currently volatile stock market. In fact, small businesses have reported sales and earnings growth at record levels over the past 2 years, and December’s report shows continued high levels of economic growth in the small business sector. Share prices for publicly-traded companies have not been connected to reality for some time, thanks to the Federal Reserve artificially holding rates down for so many years. This created distortions that will take years to resolve. Since 2008, the S&P stock index has risen 110 percent, but US output, measured by GDP, has increased only 25 percent over the same period. This indicates that the growth in output owned by each share has lagged far behind the share price, or, viewed another way, there is less real output per dollar of share price, a lower real return. So, as interest rates rise, bonds provide an attractive alternative to owning stocks, and stock prices will weaken as investment money shifts to bonds. Since the economy took off after the election, there have been two themes promoted by the press: (1) the economy is going to overheat and cause inflation and (2) the economy is slowing, and the Federal Reserve should not raise interest rates. Over that period, the NFIB surveys of the “small business” half of the economy have shown that there was and is no inflation threat and now shows that in spite of the gloom and doom in the press, Main Street remains historically very strong, setting record levels of hiring along the way. The zero-interest policy pursued by the Federal Reserve was not good policy, distorting one of the most important prices in the economy, the cost of capital. When bonds pay so little, then even ventures promising a low return look attractive to capital investors. Quantitative easing (QE) drove up asset prices instead of goods and services prices—inflation. QE also distorted the distribution of wealth in favor of the wealthy and failed to trigger a hoped-for increase in spending due to higher nominal (not real) wealth. It is important to return the setting of interest rates to markets, not policy intervention. This is hard to do; the Federal Reserve bought $4 trillion of financial assets from the private sector and gave it cash (liquidity) in exchange. That liquidity went looking for a comparable return and couldn’t find it. Now the Federal Reserve is returning those assets to the private sector, letting bonds mature, and giving the proceeds back to the Treasury. This is a de facto reduction in bond demand, lowering bond prices and raising bond yields (i.e. interest rates). So, yes interest rates will rise and no, the Federal Reserve should not abandon its policy simply because the stock market is volatile. Normalizing interest rates means normalizing asset prices. Much of the “real” economy is at record high levels for this expansion. It is hard to get more real growth from this level of full employment going forward. The Federal Reserve does want to get as far away from “0” interest rates as it can in anticipation of needed cuts in the future. But it will not do this by risking a recession. At full employment, the best they can do without pushing inflation is to keep the economy steady at its current high level of employment and maintain 2 percent GDP growth (population growth + productivity gain). 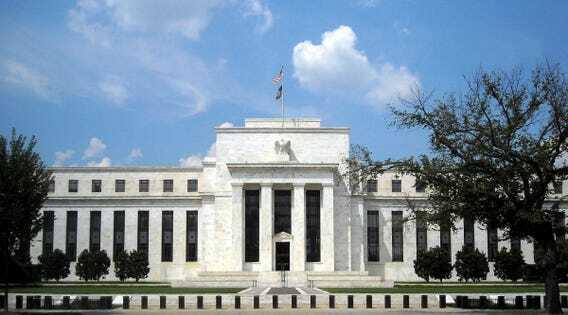 Monitoring the incoming data is the best strategy the Federal Reserve has to hold the economy steady at current lofty levels. The most recent “incoming” data from the small business half of the economy is very solid in real terms. Employment, capital spending, and inventory investment have all been strong in the latter months of the year. Hiring plans and job openings remain at record high levels, and capital spending plans are at their strongest levels since 2008. Growth will be constrained by the lack of labor to fill open positions, but the economy can continue to run at its current strong levels, a happy new year for 2019.